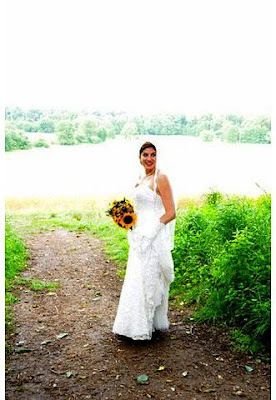 A few months ago I met Lauren Wenchel, the blogger behind Charm City Bride. Lauren is great! Super creative and WAY into weddings! Charm City Bride is becoming THE place to go for wedding ideas in Baltimore. Last week Charm City Bride celebrated 10,000 visits to its site. How exciting for a blog that's only been in existence for a few months! It just goes to show what a great service Lauren is providing! To celebrate this milestone, Charm City Bride has vendors (LoCoFlo included!) giving away great products and services as well as discounts on all sorts of wedding stuff. You can win a free portrait session, get discounts on bridesmaids dresses and invitations and even get a discount on your LOCAL flowers! Check it out! Be sure to comment here and let me know if you get to take advantage of any of these great offers! Flowers infiltrate lots of areas of my life. A few years ago, I helped start the Baltimore Master Gardening Book Club. The book club was a way for Master Gardener’s to get together in the winter and keep learning-even when it was too cold to garden. We’re entering our fourth year together. There are half a dozen regular members, and half a dozen others that come when they can. We have a great homemade meal filled with lots of local treats, we drink wine, we walk around gardens and we talk about gardening books. This month’s book was fiction. We don’t usually read fiction, but sometimes in the summer, when everyone is busy, we pick an easy read. So, the book: Hothouse Flowers and the 9 plants of Desire. You could read this one in a day. According to the author, the 9 Plants of Desire are: Gloxinia, Mexican Cycad, Cacao, Moonflower, Sinsemilla, Mandrake, Lily of the Valley, Chicory and Datura. I hadn’t heard of most of them before I read the book. The premise of the book is that if you collect all all of these plants plus the passion plant that has no name, you’ll have all of your wishes come true. Apparently from the book, collecting them is not so easy. This is an entertaining, easy read that I would recommend to anyone interested in flowers. BTW, Lily of the Valley is the only one of the 9 Plants of Desire that we’ve used at LoCoFlo. It’s a delicate white flower with great green leaves (below) We used it in a bouquet in the spring-but hope to use it more next year. While we were in Paris a few weeks ago, our one trip out of the city was to Versailles. From the outside, the Palace is pretty awesome. Inside, there were all sorts of crazy historical…stuff. While I liked touring around Louis’ bedrooms, dining rooms, sitting rooms, galleries and on and on…I kept gravitating toward the window to get a glimpse of the gardens. The Versailles Gardens are the real thing. They are old school formal like you only see in books. Usually formal gardens are not my style, but there is really no way to not to love this garden. First, the size. The Gardens themselves take up 250 acres! We were there for a whole day and didn’t get to see everything. Next, the flowers. There are formal beds with formal flowers like roses and dahlias. There were also formally laid out beds filled with wild flowers and herbs. Carolyn and Julian were married at an intimate ceremony in Ellicott City. When I first met with Carolyn and her lovely parents, she told me about her interest in having locally grown flowers at her wedding. She is an organic gardener and had worked on organic farms in Rhode Island and Hawaii. In her quest to support a local florist, Carolyn first visited a florist near her house who unfortunately told her that most of their flowers came from other countries. We’re glad Carolyn searched us out-we had a great time working on her flowers! Carolyn wanted blue and white flowers-with a splash of yellow and orange. She wanted her bouquet to have a wildflower look. After the wedding, the happy couple and their family and friends enjoyed a fabulous dinner at Tersiguel’s in Ellicott City. Tersiguel’s prides themselves on using locally grown produce and meat. Thanks to Jim Wrigley for these great photos! Congratulations to Carolyn and Julian! On Tuesday, I was super excited to donate flowers for Martha’s Place 9th Anniversary Fundraiser. Martha’s Place is a fabulous non-profit in West Baltimore that serves women in recovery from drug and alcohol addiction. The folks that run Martha’s Place; Todd Marcus, the Harris’, Angela Long and the rest of their team are really phenomenal. They are tireless advocates for women in need. I am so proud to know them and to be associated with them. I loved making the little vase arrangements that were put on the tables. One of the great joys of visiting Martha’s Place is the real feeling of peace you feel in the midst of all of the urban ills that plagues inner city communities throughout Baltimore. Having a “Green” wedding can mean lots of things to lots of people. One way we love to help brides and other clients reduce their Wedding footprint is by using recycled “vases”. Orangina bottles: You know Orangina-that weird European orange juice/soda with the bright blue label…These are perfect for cocktail tables or other small spots. Wine bottles: Here’s a great excuse to drink wine. Save your bottles, no matter the color or size and then reuse them with your favorite flowers. Do you have some examples of your own of recycled “vases”? Let us know. We’d love to hear from you! Roses are one of the most commonly used flowers for weddings. However, if you live in Baltimore and want roses for your wedding, they are probably coming from Columbia or Ecuador. These two countries account for 90% of the roses sold in the United States each year. This year, following a trend that is spreading amongst members of the Association of Specialty Cut Flower Growers, Bob Wollam of Wollam Gardens decided to put in 140 Kordes Roses-as a test. No…Kordes roses are an old garden variety of fragrant roses. I say fragrant, to differentiate them from the vast majority of commercially sold roses…that have no scent. (Scent has been bred out of roses so that they will have a longer vases life) What is a rose without that sweet scent? So, LoCoFlo was super excited to be able to use one of the first batches of Bob’s Kordes roses for Tracey and Kevin’s wedding in June. We loved them! Now, before you get too excited, we’re not sure yet what the availability of these little jewels will be. Additionally, as an old garden variety flower, these roses have a pretty short vase life. We’ll be sure to keep up with Bob to see how he thinks the first year of rose growing went. Hopefully, we’ll be seeing more of Kordes roses in the future. Tracey and Kevin are one of the most photogenic couples we’ve worked with. When I first saw Photographer Jay Moore’s photos, all I could think was “this couple looks SO happy!” Pure love and happiness seemed to be oozing out of them. When Tracey first contacted us, she said her colors were coral and champagne. She sent us some inspiration pictures so we would know what color coral she was thinking about. Apparently, coral can be a wide range of colors. We looked to Charm City Bride for some additional inspiration. Coral isn't pink. It isn't peach. It isn't orange. It's coral. Asking the farmers for coral flowers was...challenging. Most of them said they didn't know what coral was-or they had their own idea of what coral was. That being said, we picked what we thought looked the most coral and kept our fingers crossed. On their own, some of the flowers looked too pink (the snapdragons), some looked too orange (the statice)...but miracle of all miracles...we mixed them all up..and they turned out perfect! Actually, they turned out more than perfect because we got to use Wollam Gardens first batch of Kordes ROSES!!! The Bride’s bouquet was made up of a variety of colored Kordes roses, white dahlias and peach statice. The table arrangement was made from Kordes roses, snapdragons, white dahlias and peach statice. Congratulations to Tracey and Kevin! My garden is a mess. Between weddings and work and travel...I have not given my garden the love it needed this summer. However, after the rain stopped Sunday morning, I was able to go out and salvage some flowers from my sorely, under cared for plants. Not bad, considering the neglect my garden has been dealing with. So, if you're like me, and you have garden guilt about all the things you haven't done this summer, let it go for a day and go out and pick some flowers-whatever's left...you'll be glad you did. How cute is this couple! Janell and Eric's wedding was a picture perfect Baltimore wedding. Special thanks to Wendy Hickok of Hickok Photography for taking these beautiful pictures! Janell and Eric were married on a gorgeous summer day at the historic Otterbein Church in Baltimore. As you may know, I am partial to orange. In fact, I love the color orange. It is by far my favorite color for flowers (and just about everything else). 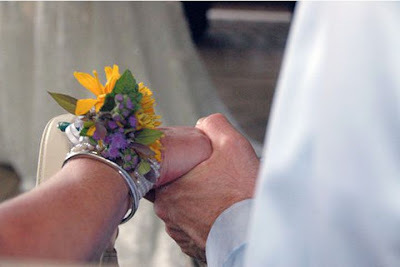 That is one of the reasons that this wedding was one of my favorite weddings...ever! Janell loved the flowers too! The bride's bouquet was full of orange and white dahlias, hens and chicks, and variegated wiegela. The bridesmaids' bouquets were similar...just more orange dahlias. The reception was at the Camden Club at Camden Yards. 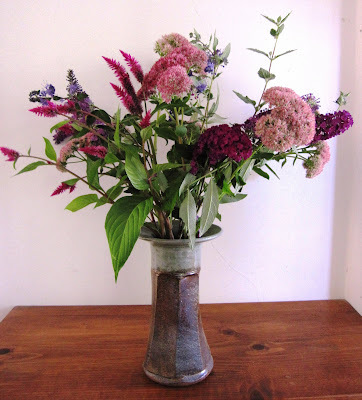 The table arrangements were one tall, decorative tin can full of curly willow, hydrangeas and mint. The tall cans were surrounded by three small tin buckets full of yellow, orange, green and white zinnias. Congratulations to Janell and Eric! Geoff and Shelby worked hard to plan a Green Wedding that would be naturally beautiful, easy on the environment and within their budget. 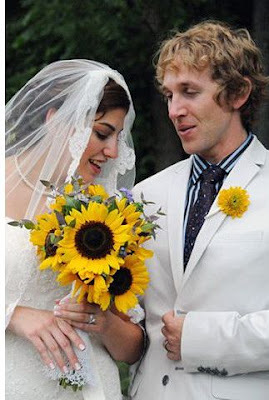 Their journey was chronicled in a Style Magazine article written by Laura Wexler last winter about Green Weddings. When Geoff and Shelby contacted us back in April, they had a pretty good idea of what they wanted: locally grown sunflowers with splashes of purple and green. Simple, natural, perfect for their special day. 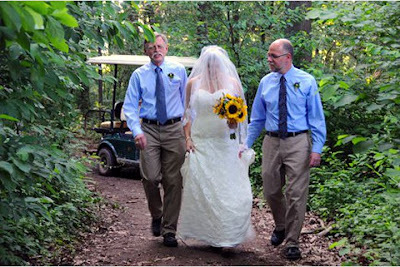 Geoff and Shelby were married at Irvine Nature Center's new, Green, state of the art facility in Owings Mills. One of the highlights here is definitely the view! The wedding party and guests hiked 5 minutes down a wooded trail to get to the wedding gazebo. 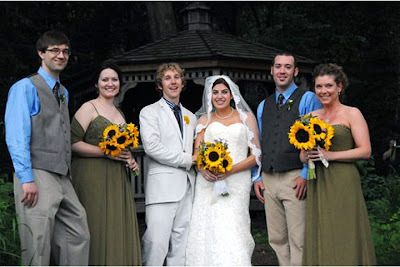 The sunflowers, ageratum and mint added a perfect pop of color in this rustic setting. What a wonderful day for this beautiful couple. Congratulations to them both! And thanks to Susanna Liu for the great photos!